IPOPI recently released a new series of patient information leaflets during the 2016 World Primary Immunodeficiencies Week! These three new leaflets provide helpful information and guidance for patients, their families and other interested stakeholders of the Primary Immunodeficiencies (PID) community and are now available here. 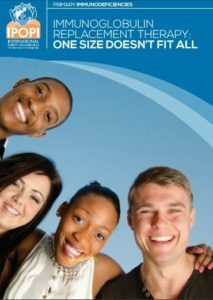 The first leaflet ‘Immunoglobulin replacement therapy – One size does not fit all’ explains the variety of factors that patients with PIDs should consider, and discuss with their physician,when an immunoglobulin replacement therapy is chosen. 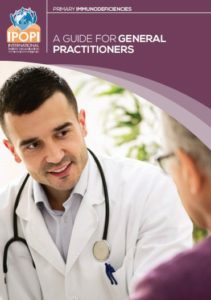 The second leaflet, ‘A guide for general practicioners’, targets general practitioners (GPs) and provides guidance on how they can play a crucial role in identifying patients with PIDs but also discusses key aspects of patient care while the third leaflet ‘How are primary immunodeficiencies classified?’ explains the latest classification system for primary immunodeficiencies. IPOPI wishes to thank Baxalta for their support! 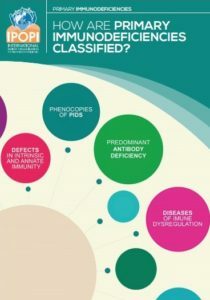 How are primary immunodeficiencies classified?